Posted on December 14, 2011 by catherinedaze	This entry was posted in Machines and tagged sewing, sewing machine, tension. Bookmark the permalink. The problem with getting your SM serviced is that you have to live without your machine while it’s being serviced. Sigh. I will have my fingers crossed that you make it thru the holidays. Thanks! At least I have the overlocker if it does pack up but it’s not the same. I fool with that screw on my Featherweight bobbin case. What kind of machine do you have? Mine’s an Elna. Glad to hear other people have done this successfully! This trouble I also had years ago, and a pensioner who used to fix machines told me to do the same, apparently after a lot of use things do work loose, bit like me I suppose. Good on you for letting others know, it does save a lot of frustation. Hi Catherine. I have a very old Toyota machine and it’s always been my understanding that that screw is the official way to alter the bobbin tension. Threads are not always the same thickness and you need both bits of the machine to be running properly. Again my understanding is that once the bobbin is in, you should be able to dangle the bobbin and holder by holding the thread and it all stays put, but if you give it a small, sharp downward flick, like setting a yoyo going, it should slip down by about an inch, no more. It really works for me and often if I have problems with tension I will check this and find it to be the problem. I had my machine serviced a couple of years ago (it’s 30+ and had never been touched) and got a good telling off for not keeping it clean, but it really made a difference to how it ran! 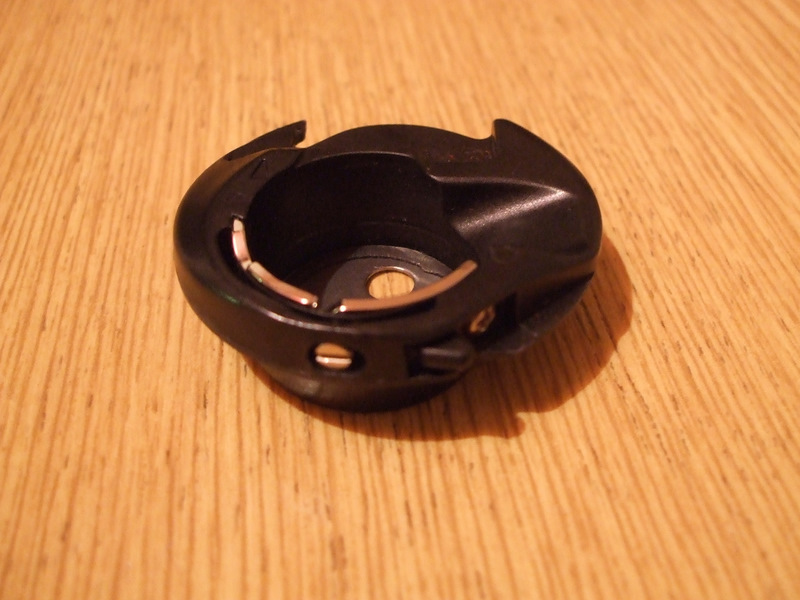 Interestingly, the bobbin holder was replaced then as it was worn. thanks! I’ll give that a go. It’s good to know what to be looking for.